I believe most people will agree with me on this. I love Canon Creative Park so much. As one of the leading printer manufacturer, Canon is making a great work here. 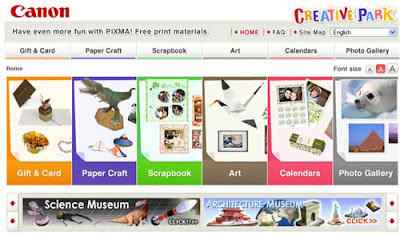 Just tell me what type of papercraft you want and you will definitely find it here. A cool high quality template, from paper model, to greeting cards and boxes. Scrapbook and so on. Yes, you will totally be stunned with their magnificent works. And what's more, almost all them come with its tutorials and instructions.